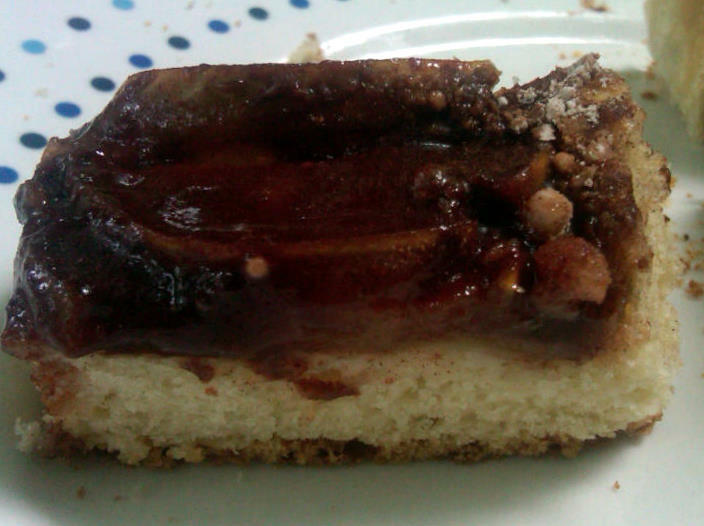 I promise a new baking post soon, maybe even tonight, but in the meantime, please enjoy this post from the DH, Paul LaRosa, about my baking-related experience this weekend! FedEx delivers from Brooklyn to Manhattan — by air! Normally, I have no complaints about FedEx. They do a pretty good job with most everything I send but last night I entered into the twilight zone of FedEx and the experience left me feeling like Tom Hanks in “Castaway” without the coconut to keep me company. 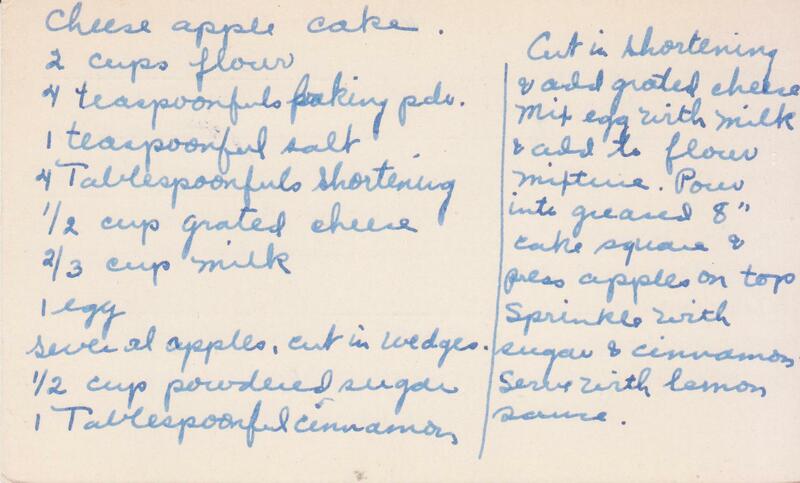 My wife is planning an event this week called “Real Housewives of Henry Street” and the idea is to show how immigrant housewives lived on the lower East Side back around 1905. In fact, the event costs $19.05 to get in. Clever, right? 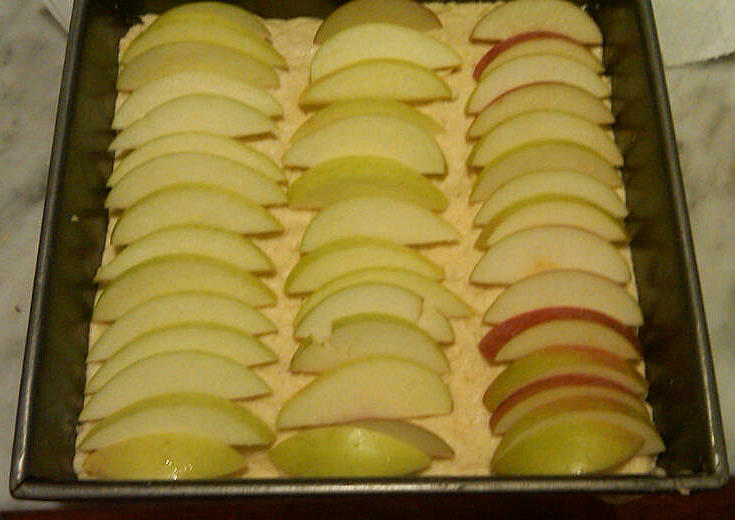 Anyway, one of the treats she’s cooking up is apple strudel and she plans to make a lot of it. She needed a dough hook to knead the strudel dough so she wouldn’t be tied to the kitchen all day like, you know, a 1905 housewife. Taking advantage of a modern convenience, she went online and ordered a dough hook to be delivered to her by FedEx to her work address which is on Henry Street in Manhattan. That’s where the fun began because there is also a Henry Street in Brooklyn and, for whatever reason, FedEx took it upon themselves to make “an address correction” and sent the dough hook to Brooklyn. My wife found out about the mistake yesterday and told FedEx they had made “an address in-correction” but it was too late. The hook was in Brooklyn, not far from Red Hook coincidentally. After many phone calls and hours on the phone, she told FedEx she would pick up the package at the FedEx “world center” in Brooklyn. Some anonymous person on the phone agreed. And that’s how we wound up on a very rainy Friday night on a long line at the FedEx “world center” in Brooklyn in a neighborhood where you definitely wanted to make sure your car doors were locked. Finally, we got to the front of the line and, after much hemming and hawing, a FedEx gal produced a package. We signed, relieved and were about to walk out when I looked down at the name — it was not my wife’s. “This is the wrong package,” I said. The FedEx gal then disappeared into the back again and, when she reappeared, said another employee was doing her “a favor” by looking for our package. This is why I love when FedEx packages just appear and I am not forced to come face to face with this kind of customer service. Now mind you, we could see the trucks which were in the next room, a garage. “What does containerized mean?” I asked. There were a couple of things about what he said that struck me. First that the package was going to the correct address, Henry Street in Manhattan but no one would be at my wife’s closed office the following day. She needed the dough hook to make a whole lot of strudel for the Sunday event. It was get it now or forget it. The other thing that struck me was….THEY WERE PUTTING IT ON A PLANE TO GET TO MANHATTAN????? Even Mr. Rain-soaked man could see how insane this was. Remember, the package we desperately needed WAS IN THE NEXT ROOM AT THAT VERY MOMENT! I flashed on Tom Hanks with his stopwatch in “Castaway” where he plays a FedEx employee and realized he had nothing on this guy. What followed were a lot of irritated sentences that ended with the phrase “you realize how insane this is” but he wasn’t budging. Finally, my wife told him to send the package back from whence it came — if she didn’t get it immediately, she couldn’t use it. The irony is that she wound up making the strudel by hand with no help from a motorized dough hook — just like they did in 1905. 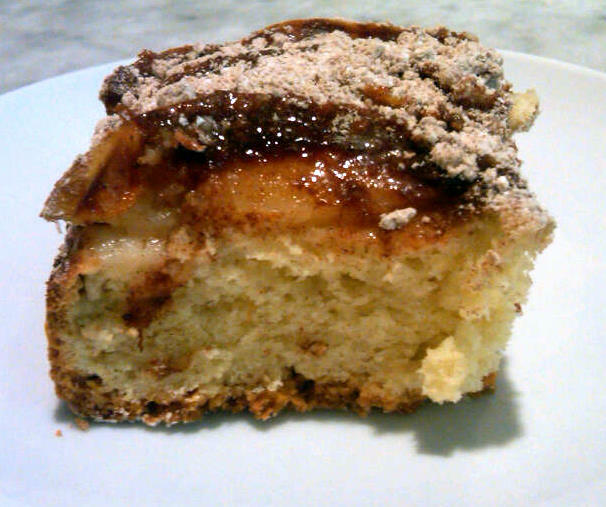 I'm happy to report that I conquered my fear of strudel -- and then ate it! 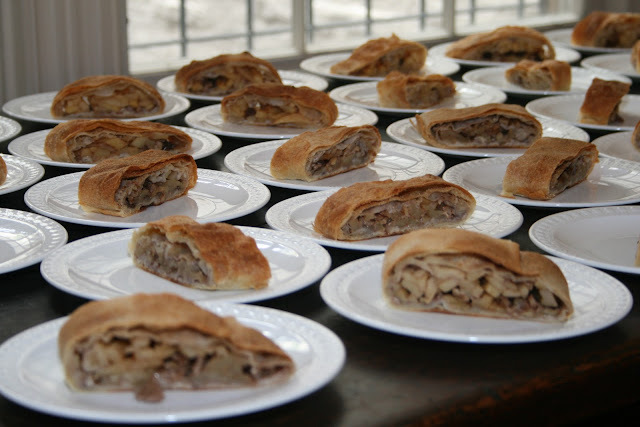 I had a very compelling reason to practice -- on September 25th, I'm baking apple strudel for the 60 guests attending The Real Housewives of Henry Street, 1905, an event I'm hosting at Henry Street Settlement. 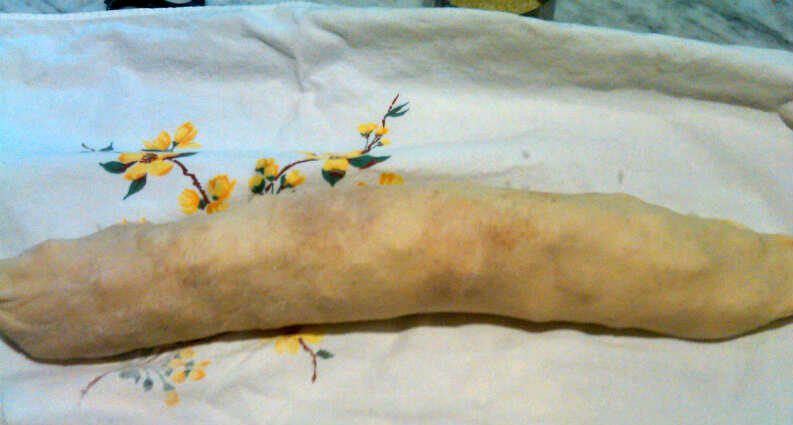 Making strudel dough is fun, much easier than you might imagine and very satisfying. I was lucky to get a fabulous recipe from Jane Ziegleman, author of 97 Orchard, who will be the event's main speaker and who will demo strudel dough, with audience participation! Combine the flour and salt in a mixing bowl. Make a well in the center of the bowl and pour in the water, vinegar and oil. 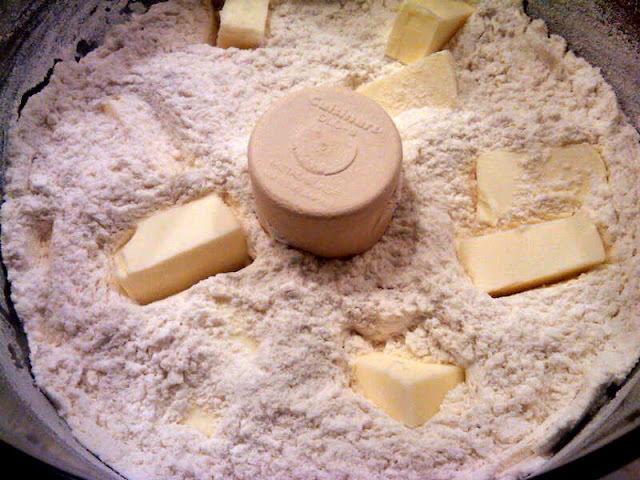 Stir from the center outward in ever widening circles until all of the flour has been incorporated into the liquid. The dough should look shaggy and somewhat dry. 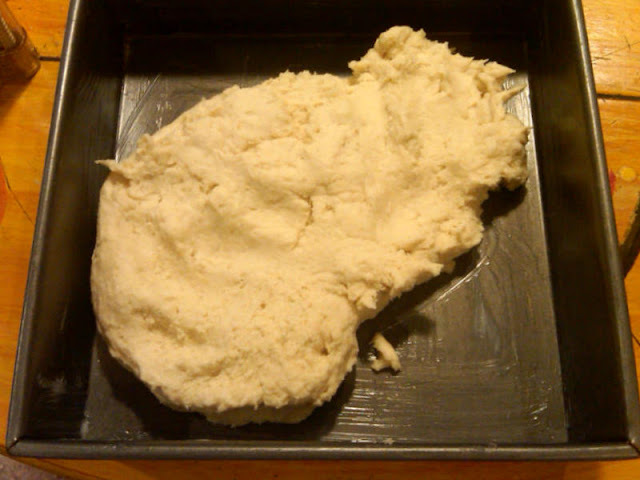 Turn dough onto a floured work surface and knead vigorously for 10 minutes. Alternately, you can knead the dough in a standing mixer using the hood attachment for 3-4 minutes. 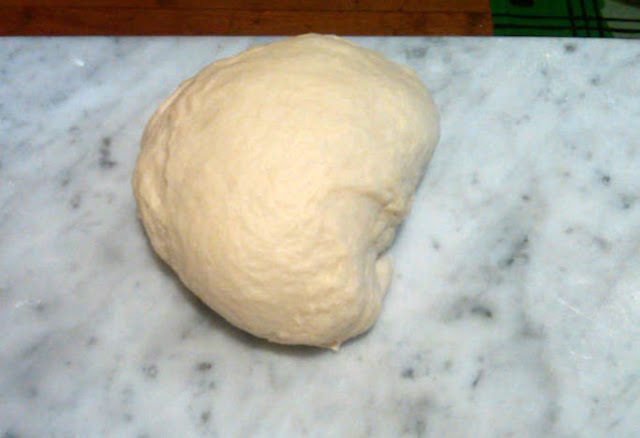 After kneading, the dough should be springy and glossy. Coat lightly with oil and leave in a covered bowl to rest for at least 1/2 hour. Cover a fairly large table with a clean tablecloth and dust well with flour. 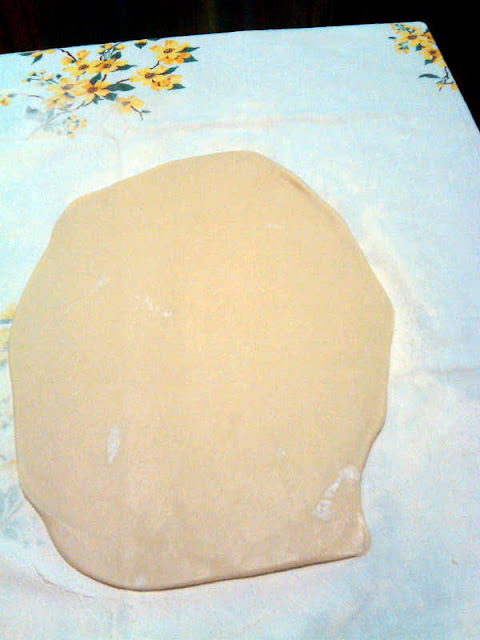 Place dough on the dusted cloth, flatten with your palms and, using a rolling pin, roll into a 9 inch circle. Drape the dough over the backs of your hands, you fingers loosely bent, and begin to pull the dough outward, stretching it gently. Keep rotating the dough so it stretches in all directions. When it gets too large to handle, lay it on the table and continue. 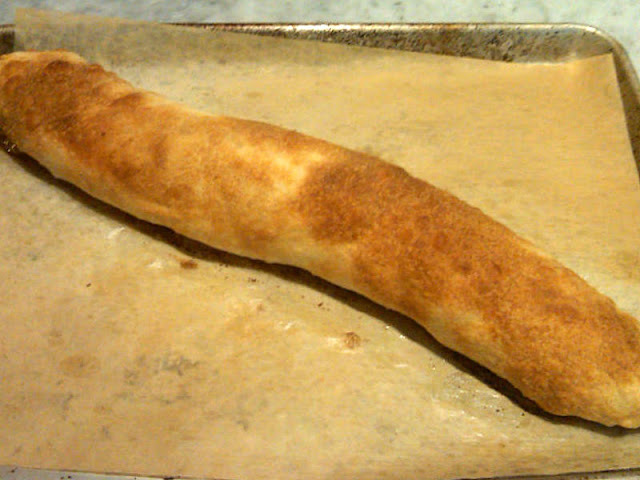 Ideally, the dough should be rectangular, 3 - 4 feet long, and thin enough to see through. The edges will be comparatively thick; trim them off with kitchen shears. Brush dough lightly with melted butter. Sprinkle with breadcrumbs. Spread filling along the bottom third of the dough. 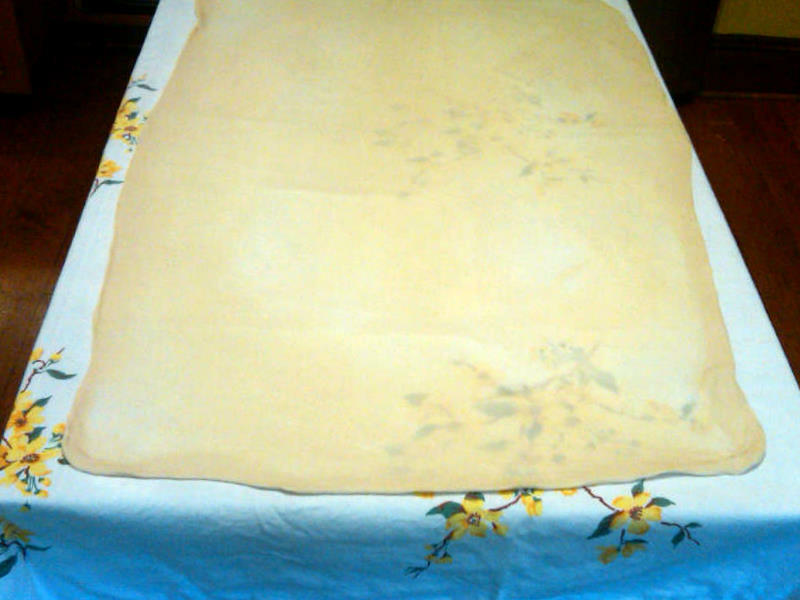 To roll strudel, hold the edge of the tablecloth that is closest to you and gently raise it above the surface of the table so the strudel flops over. 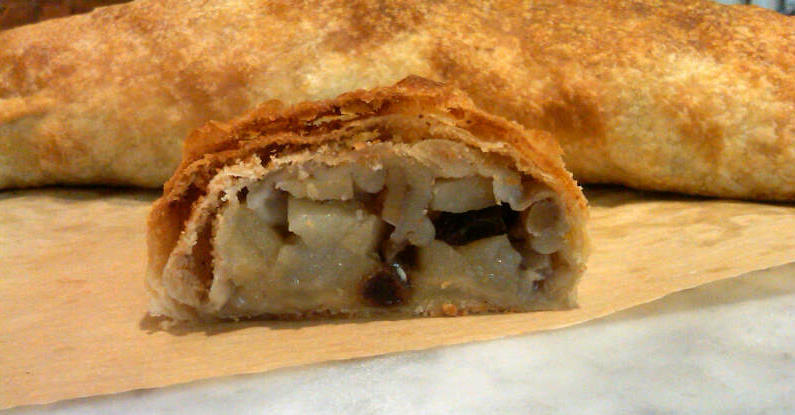 Repeat until strudel is fully rolled. Using the tablecloth as a sling, transfer strudel to a baking tray that has been lined with parchment paper. If the strudel is too long, bend it into a "U" shape. Brush one last time with melted butter. Bake for 20-25 minutes or until golden and crisp. 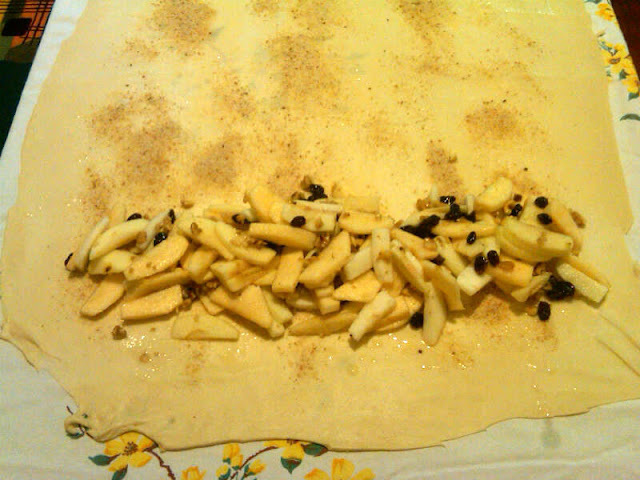 Mix and knead strudel dough as instructed. While dough is resting, prepare the filling. 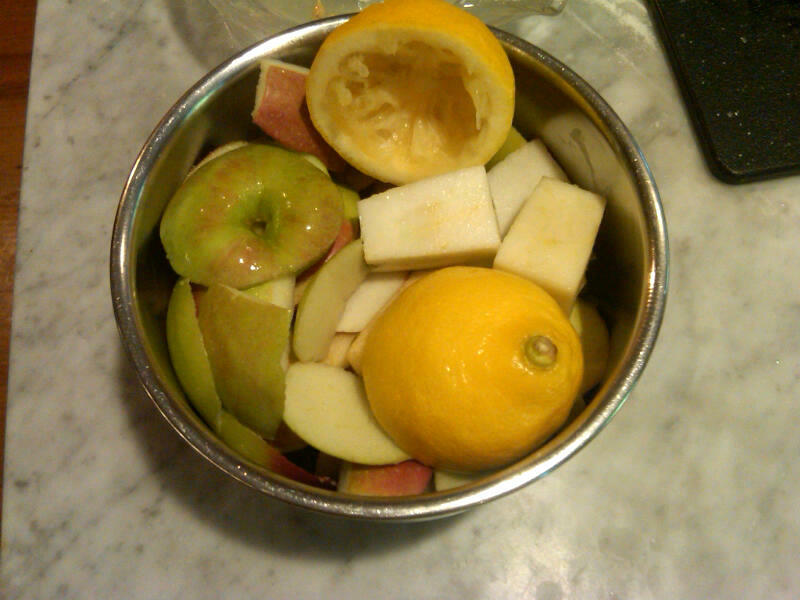 Toss apples with sugar, cinnamon and lemon juice. Stir in chopped walnuts and raisins. 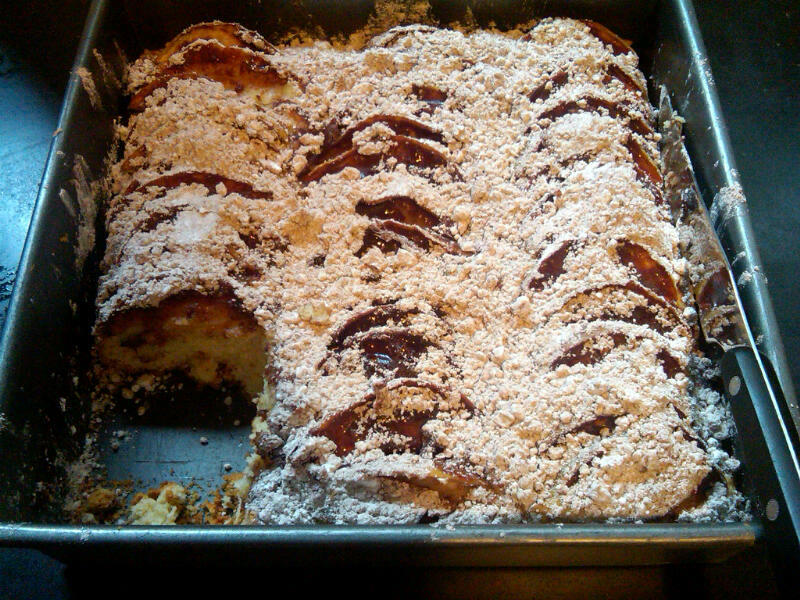 Ross out strudel according to instructions in the Basic Strudel Recipe. Brush with butter and sprinkle with breadcrumbs. Spoon filing along the bottom third of the dough, leaving an inch or two on the sides to prevent the filling from oozing out the ends. Roll strudel. Transfer to baking tray. 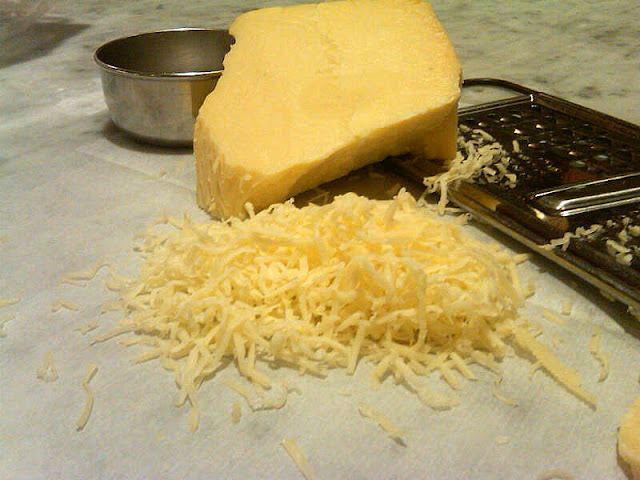 Brush the top with butter and bake for 20-25 minutes or until golden and crisp.